The AJWIP library and debug program is used to create web pages using the Java language. It is kinda like Apache Wickets but a much simpler interface (IMO). It is not design so that you completely build the HTML pages using the AJWIP library. No single language can be used to handle all your programming needs. People sometimes go bannas with a new language or an old one and try and use it for every thing which can lead to a big mess and poor code. The AJWIP debug program allows you see and debug your web pages without having to write commented debug printouts in your web pages. The AJWIP debug program listens on a UDP port number for messages sent by the AJWIP library. Started this project for embedded devices like Cubiebaord2 computers but can be used on any computer that supports Java. The AJWIP library uses the Jetty web server library to make the whole startup and shutdown of a web server painless and easy. The AJWIP web source code is an example of how to use AJWIP library and also uses the Apache Derby Java database but can easily use any database system like PostgreSQL for example. The image to the left is of the test web page. The source can be found in the ajwipweb-1.?. ?.zip file. 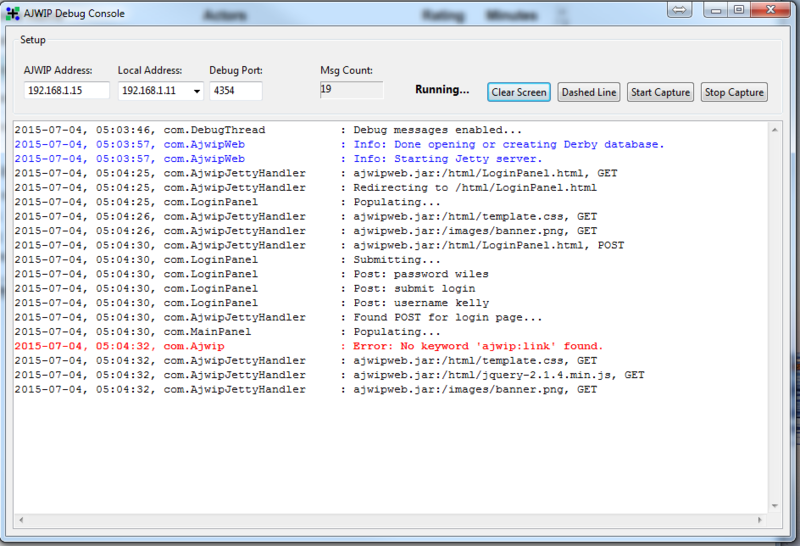 Here is an example of the MainPanel page of the AJWIP web example. Example. Contact me at rkwiles at twc.com if you have questions. I am planning to release the AJWIP library as an open source project but I am wanting to make sure the code is good enough for a prodution environmant. If you are wanting it sooner then please contact me at the email address above. Sorry about the large changes between version but the AJWIP is evolving. Please stick with me and it will settle down and become more stable and have less changes per release.